BOOK REVIEW: Lisa Maxwell's "The Last Magician"
Without spoiling too much, I have to begin my review of Lisa Maxwell’s The Last Magician by remarking that it is one of two novels that, upon finishing it, made me promptly want to scream with frustration. The other novel is Haruki Murakami’s 1Q84. What do these two books have in common? Namely, they don’t have endings. Or, rather, the endings they do have go beyond making an artistic statement of leaving the story open-ended, and come off as if the author either tired of the writing process and just stopped before the expected denouement, or realized they had word-built themselves into a corner and didn’t know how to resolve the plot satisfyingly. When I blazed through 1Q84’s thousand-plus pages, eager to see how this complicated, fantastical story would be resolved, I was infuriated by what seemed like the ultimate cop-out. It was as if there were another 200-300 pages of plot actually missing—once the lovers are united, the story just stops. The same scenario, oddly enough, happens in The Last Magician. We’ve been building to what feels like the ultimate magical showdown between good and evil, but once the lovers reunite and decide that they’re going to take on the Big Bad together, the book literally ends. No epilogue, no hand-wavey acknowledgement of how the Big Bad was defeated, if at all, no bittersweet ending with a noble sacrifice that also defeats the evil (a la A Great and Terrible Beauty); I would honestly have preferred something like Veronica Roth killing Tris in the Divergent series than just leaving the entire story unfinished. I am sure that there are literary reasons to leave a narrative unfinished, but in genre fantasy fiction with clearly delineated rules and world-building and a fairly linear plot (time-traveling shenanigans aside), it honestly feels like cheating the reader. Upon looking online, I’ve found references to a sequel that the author is working on; in that case, a “to be continued” capping off the cliffhanger ending really would have mitigated much of my frustration. The lack of ending in The Last Magician is a shame, because it pretty much dampens my enthusiasm for what was otherwise a pretty charming and well-paced novel. While it did take me a few chapters to get fully hooked on the story and become invested in the characters, once the story falls into its rhythm and establishes the stakes, I couldn’t put it down. I’ll go through the basic world-building without getting too into the details. Basically, New York City is the site of two warring factions of magic-users: the Mageus, who are born with their magic abilities, and the Order, a sinister society dedicated to harnessing acquired magic and destroying the Mageus. At the turn of the twentieth century, this fight was a part of daily life, with gangs on the streets fighting over territory as well as protecting (or destroying) the Mageus in the city, but in the present day, the Mageus have been forced underground by the Order. Esta, the protagonist, is a Mageus with the ability to travel through time, and is an orphaned master thief. Naturally, she uses her gift to go through time and steal various magical artifacts that her employer and father-figure, Professor Lachlan, needs to defeat the Order and free the Mageus once and for all. After mucking up a time-traveling heist, Esta is given a chance to make things right—she needs to go back to the early 1900s and retrieve a magical book of spells in the possession of the Order that will give the Professor what he needs. The bulk of the story takes place in this time period, giving Maxwell plenty of opportunities to play with the real-life New York of the Progressive era and imbue it with the magical aspects of the plot, clearly reveling in the idea of turn-of-the-century New York as the fresh melting-pot of immigrant life. The Order is made up of the most elite New Yorkers, including members of the Morgan family, while most Mageus are refugees from European witch hunts, hoping to survive in America. The wrinkle is that once the Mageus arrive in New York City, they’re trapped by a mysterious barrier that, if they cross it, will drain their magic abilities and their life force. The Order wants to use their magic to pull off a magical ethnic cleansing, to rid the city of the double scourge of Mageus and immigrants. Esta makes her way to the gang that, in the past, actually pulled off the heist of the book from the Order, hoping to infiltrate the group and find an opportunity to steal the book herself. The gang is full of colorful characters with gifts (here called “affinities”)of their own, led by Dolph, a young German Mageus whose affinity allows him to sense those of the people around him. There’s Jianyu, a Chinese Mageus who can turn invisible; Viola, a (rather stereotypically) hot-tempered Italian who has a way with knives; and Nibsy, Dolph’s bespectacled second-in-command and strategic expert. Dolph turns out to be the second protagonist of The Last Magician, and his main concern is trying to protect his fellow magic-users by stealing the book. To this end, he reaches out to Harte, the third protagonist, a former friend who now works as a stage magician, hiding his Mageus abilities under the cover of more palatable illusions and tricks. When Esta is thrown into the mix, she finds herself tested by Dolph’s group to prove her trustworthiness, and is thrust into the role of a honeypot in order to sway Harte to Dolph’s cause. I don’t want to get much more specific about how the plot goes without risking spoilers or making this review another thousand words long. Once Esta and Harte meet, sparks fly in a manner right out of the most delicious of trope fanfic: naturally, he has to kiss her without warning in order to save her from a dangerous Order-affiliated gang, and she bites his tongue to the point of bleeding for his trouble. This, of course, before they’ve actually been introduced properly. I have to admit being a sucker for this kind of fight-cute relationship (see: The Man From Uncle’s Illya and Gaby), and as Esta and Harte became closer and closer without ever actually declaring their burgeoning feelings, I felt myself practically squealing with delight, to the point where I somewhat jokingly tweeted at Maxwell, asking if there was an official ship name for Esta and Harte (Estarte? Hesta?). The plot itself escalates as we narrow in on the heist, and experience Esta's growing ambivalence about betraying the people she's met in this strange old-new world, and the twists and turns (and reveals) leading up to the cut-off cliffhanger ending had me on the edge of my seat. In conclusion, I would absolutely pick up the sequel to The Last Magician, but the success of a story should not depend on whether or not there is going to be a sequel and, therefore, any kind of resolution to the plot that occupied the previous hundreds of pages. 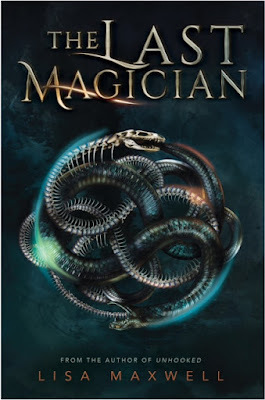 Therefore, I would recommend waiting until the release of a sequel before reading The Last Magician, because otherwise, you might just be as frustrated as I was with its non-ending.